A large earthquake has taken place off the coast of Chile. The quake occurred at 03:34 am local time (06:34 GMT) today. The USGS initially reported a magnitude of 8.3, but that has just been upgraded to 8.8. The earthquake was located off Maule, 325 km SW of the capital Santiago and 115 km NNE of the city of Concepción, with a reported depth of 35 km. The NOAA Pacific Tsunami Warning Center (home page) reports that a tsunami warning has been issued for Chile and Peru, and a tsunami watch has been issued for Ecuador, Colombia, Antarctica, Panama and Costa Rica. The BBC reports that the Japan Meteorological Agency ‘has warned of a potential tsunami across the Pacific’ (NOAA tsunami travel time map). Little news is available from Chile at the time of posting (it is less than two hours since the earthquake). La Tercera is reporting at least two deaths, power cuts, damage to communications networks and extensive property damage. UPDATE: Reuters, quoting Chilean President Michele Bachelet, reports that ‘at least six people’ have been killed. 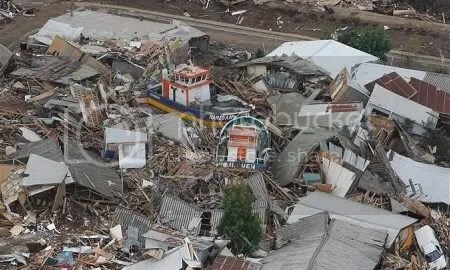 FURTHER UPDATE: The confirmed death toll has risen to 47, and a state of emergency has been declared in the most seriously affected regions of central Chile. Chilean television station 24 Horas is now (11:31 GMT) reporting 64 dead. Live streaming of Chilean television (24 Horas) here. Posted by admin in Iceland. Back in November 2009 we reported (thanks to Boris Behncke) that there was significant earthquake activity along the Reykjanes Ridge south-west of Iceland. Well, it seems to be happening again (and again, thanks to Boris for the tip-off). 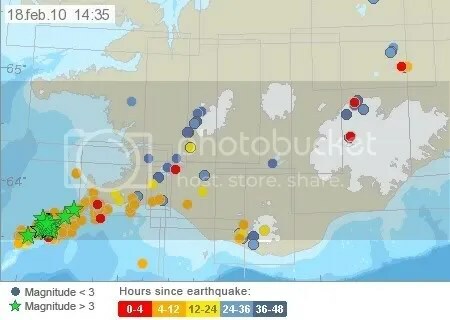 The above detail of the earthquake activity map at the Iceland Meteorological Office website shows the recorded quakes up to 14:35 UTC today; the largest quakes have been between magnitudes 3 and 4. This is a volcanically-active area (part of the Mid-Atlantic Ridge System) and it’s worth keeping an eye on what happens there. UPDATE 19 February 2010. Erik has posted a very informative piece on the Reykjanes Ridge quakes at Eruptions. For many years earthquakes and volcanoes were closely associated in the public mind. We now know that, while they are related, and all volcanic outbreaks are accompanied by earthquakes, all the greater earthquakes occur in regions remote from volcanoes or if in volcanic regions at a time when the volcanoes are not active. 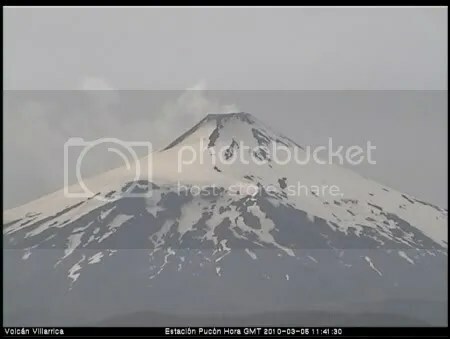 In the great Japanese earthquake of 1923 Fujiyama, an extinct volcano, was strongly shaken but was not roused to activity. On the other hand, the greatest eruption of Vesuvius in recent times was an explosive outburst near the same time as the California earthquake of April, 1906. This may have been a coincidence, but there may have been some relation, though if so it was more probably in the trigger force which timed the events than the events themselves. It would seem that the volcano is a localized and rather superficial phenomenon as compared to the earthquake. N. H. Heck, ‘Earthquakes, a challenge to science’, The Scientific Monthly, vol. 31, no. 2 (August 1930), pp. 113-125, here p. 116.